View of the Aberdulias Waterfall in Wales. For over three hundred years this waterfall on the River Dulais has provided the energy to drive the machinery of industry from copper and iron to flour and tin. 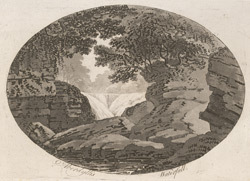 The waterfall attracted many great artists such as J. W. Turner, and more than 50 illustrations are known to have been made during the 18th and 19th centuries.